Every now and again, while browsing online music streaming websites, you come across a real gem. Skyline is one of those gems. The fourth album released by Barock Project (their first through Artalia records), this superb collection of songs makes me extremely sorry to admit that I’m the Johnny-come-lately to this group. Together, Luca Zabbini (keys, bass, vocals), Luca Pancaldi (vocals; formerly of Children of the Damned, an Iron Maiden cover band), Eric Ombelli (drums), and Marco Mazzuoccolo (guitars) form the core of Barock Project. 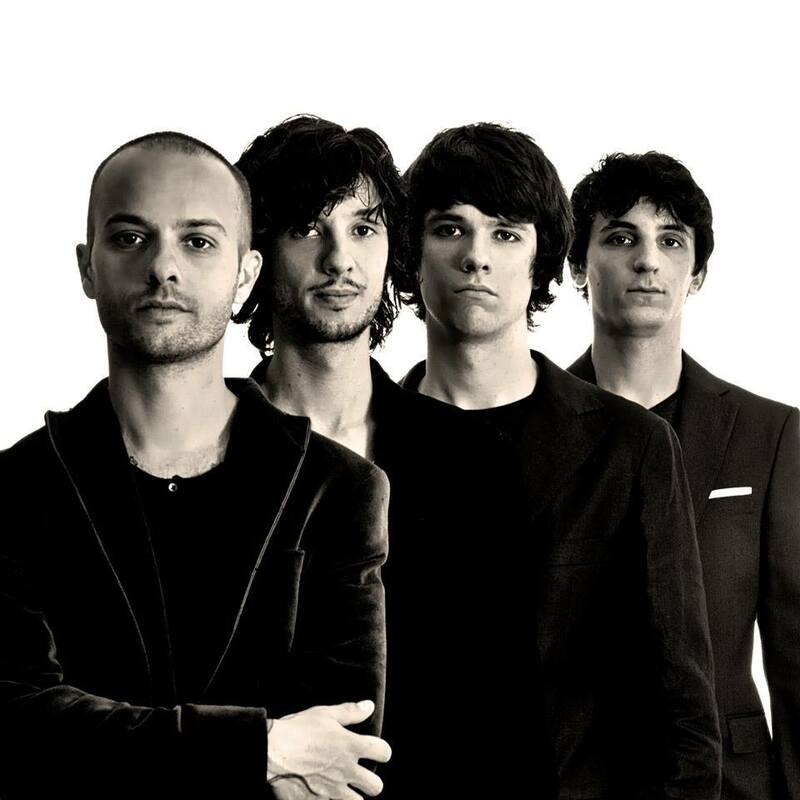 Because the bass parts Zabbini wrote are as complex and demanding as the keys parts, the band have also added Francesco Sherman Caliendo as their live bass player for the tours supporting the album. Furthermore, Skyline marks Mazzuoccolo’s first recording with the band, as he joined Barock Project in 2012 after their third album release. Skyline is a moving and deeply nuanced journey into modern symphonic writing, containing pieces that implement baroque style, contrary melodies and blend them with stylistic staples of 70‘s-style progressive rock. Released in June, Skyline follows three other albums (MisterioseVoci, 2007; Rebus, 2009; Coffee in Neukolln, 2012) and joins the band’s catalogue as its crowning achievement. 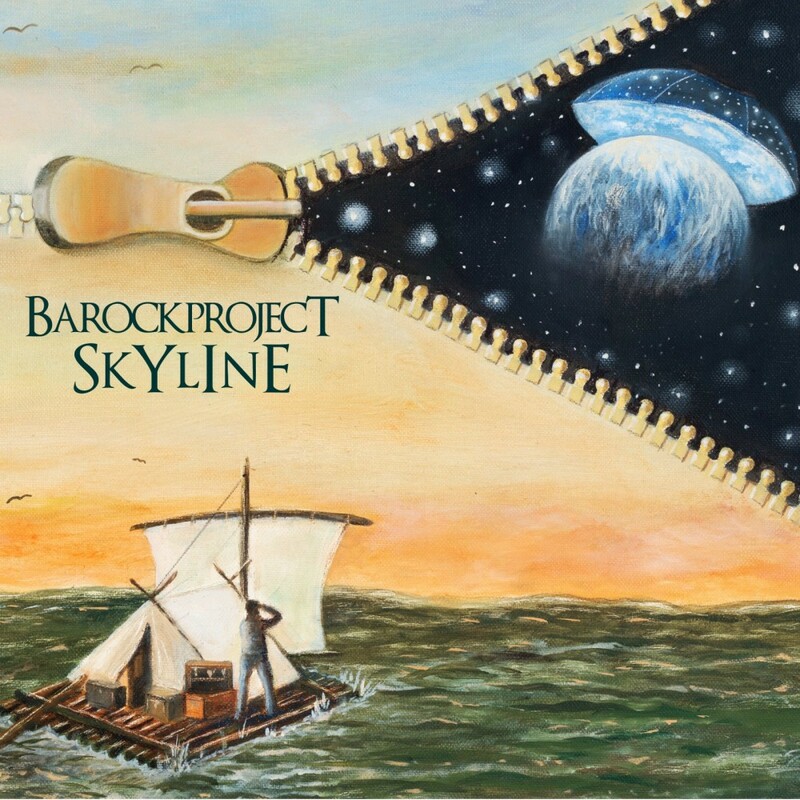 There’s a definitive 70’s progressive flavor to Barock Project, but what I particularly love about Skyline is that the similarity isn’t stale or forced: Zabbini’s passion for the first wave of prog simply exudes from his compositions. This is not a gimmick or a halfhearted homage. Skyline is like an album written in 1970’s UK, transplanted to our decade, and completely re-mastered to give it a modern feel. Skyline also features the artwork of Paul Whitehead, who designed album covers for Genesis and Van der Graaf Generator. The imagery selected for Skyline’s cover is apropos for an album largely concerned with “the song of the universal mind,” peeling back the horizon for a glimpse of what really gives meaning, and the fact that we are all just sailors “flying blind” in our quest. “Gold,” Skyline’s opening track is virtually an extended hemiola in 5/4, and represents a strong first showing of Barock Project. The composition features all of the band’s characteristic elements: strong vocals, tight instrumentation, and incredibly nuanced writing. The song begins with lush, unaccompanied vocal harmony in the vein of something by Moon Safari. The brief transition to nasty 4/4 rock n’ roll at the 3:30-minute mark is a nice transition. Pancaldi’s lyrics are uplifting and warm: “Open the windows wide until you say / It must be love that blows these clouds away / We’ll take the darkest skies and paint them gold / You’ll never fly / Until you leave the ground.” The most important things, Pancaldi asserts – things embodied in the imagery of gold – are only as good as the risk undertaken to acquire them. The only complaint I have about this incredible piece of writing is its weak conclusion: as the tension mounted toward a huge finale, I anticipated a huge crash for an ending, but instead the band opted to gradually disassemble and leave Zabbini’s warbling synth to finally collapse in on itself. I’ll force myself to move on, because there are 9 more tracks to write about. “Overture” is arguably the most complex piece on Skyline and is also the album’s only completely instrumental track. The tight conjunction of Ombelli’s percussion and Zabbin’s work on keys and bass together channel ELP, and Mazzuoccolo’s impressive guitar chops only augment that comparison, giving this 70‘s-flavored composition a meaty, modern feel. I would have perhaps liked to see a little more of the musical ideas introduced here manifested in the album’s later tracks, but Skyline is not a dedicated concept album so the lack of more interwoven musical themes throughout is excusable. Bottom line, there’s a lot packaged into this dense little track – tight guitar licks, unison chops, meter and feel changes, and overdubbed layers of instrumentation. The album’s title track is the first of two songs that top 10:00 minutes in duration, and also features Vittorio De Scalzi (The New Trolls) on vocals and flute. The first four minutes of this track are a simple mariner’s ballad in lilting meter: melodic, solitary acoustic guitar and rhythmic percussion provide the backdrop for De Scalzi’s throaty vocals. All that’s missing is “Yellow Submarine”-esque background ambiance. At the 4:20-minute mark, Mazzuoccolo’s overdubbed electric guitars enter and radically alters the song’s feel and momentum, expanding on a pentatonic guitar melody. Following the final verse, De Scalzi explodes into his rousing flute solo, clearly channeling Ian Anderson in both style and delivery as he carries the final 60 seconds of the song to a strong conclusion. “Roadkill” begins in steady 4/4, with guitar and strings ambiance, then shifts to piano and synth in 6/8 for its latter half. Pancaldi’s lyrics seem to explore themes about the value of life, embodied in the negative imagery of careless drivers: “The light falls down on this dreary sacrifice / Taking all we’ve saved / Sensing you the rodents dart away.” De Scalzi’s flute work briefly returns for this tune. Though brief, “The Sound of Dreams” is a gentle, piano-based ballad with acoustic guitar, strings, and flute accompaniment. Pancaldi briefly expands upon the verse melody from “Gold” before the melodic descending theme begins. This is a simple but gorgeous piece of writing that nicely connects the beginning of the album to its latter half. The next song, “A Winter’s Night,” is a gentle composition, a minor-toned ballad that once again combines acoustic guitar and lush piano. This song’s tonality and focus have certain theatrical qualities: emotive climaxes, a clear spotlight on the vocals, restrained instrumentation and gentle solos, infused string parts. Skyline’s final track, “The Longest Sigh” kicks off in huge, symphonic fashion: soaring synth and guitar combine in a powerful, anthemic burst in 7/8. This conclusive track’s huge lyrics are well-suited to Pancaldi’s bold voice: “There’ll be no need for grief for me / We’ll soar all night / Shoot the breeze / I’ll be free / I’ll never be a dusty souvenir.” This is a powerful finish to a powerful album: Skyline started big and ended big. The “longest sigh” is, therefore, not one of relief, but of freedom. It’s difficult for me to point to a favorite tune on this album, much less a favorite element. Skyline is consistently and thoroughly good across its ten tracks, just as the band are all talented, rehearsed, and complimentary to one another. Skyline’s supreme quality is partly a result of the band having performed the songs live and working out their kinks before pressing them on an LP. It’s also due to Luca Zabbini’s powerful and focused writing abilities, and his bandmates’ equal virtuosity. In a nutshell, Barock Project is the melodic brightness of Moon Safari and the synth-based, pop-influenced anthems of Toto, all wrapped up in the nuanced complexity of Gentle Giant. Rapid, interlaced melodies across the band’s instrumentation create flurries of unison licks and thick tapestries of symphonic harmony. There’s something distinctly youthful and energetic in their music, despite the fact that they deliberately pull from a neo-baroque style of composition, influenced as much by jazz as it is by 70‘s prog. But instead of treading well-worn paths, Barock Project manage to be forward-facing and supremely inventive. Fan of old prog, don’t miss this album. Fan of new prog, don’t miss this album. “Pancaldi’s Lyrics” !!!!!!! C’mon, read the credits! Greatest new band in not only “prog” but in REAL Rock as well!